We went out this morning in brilliant sunshine, and it was warm too, what a change! Let’s hope that this means that things have been sorted out in the meteorological department and that we might even have a summer this year. Perhaps that’s too much to hope for – but do your best up there. As we walked down the road we stopped now and then to admire the Meadow Foxtails, who are now showing a good coat of Reynard Red. This is quite a strong colour for a grass, they tend more towards the pastel shades, which is why grass flowers are more interesting, they are harder to spot and more difficult to recognise as being in flower, grass is grass after all. The Buttercups had obviously had the window cleaners round, their petals were shining so brightly, busy reflecting the sun for all they were worth, it was quite dazzling. As the grasses on the verge have grown taller so have the Buttercups, struggling to keep their heads above ‘water’. 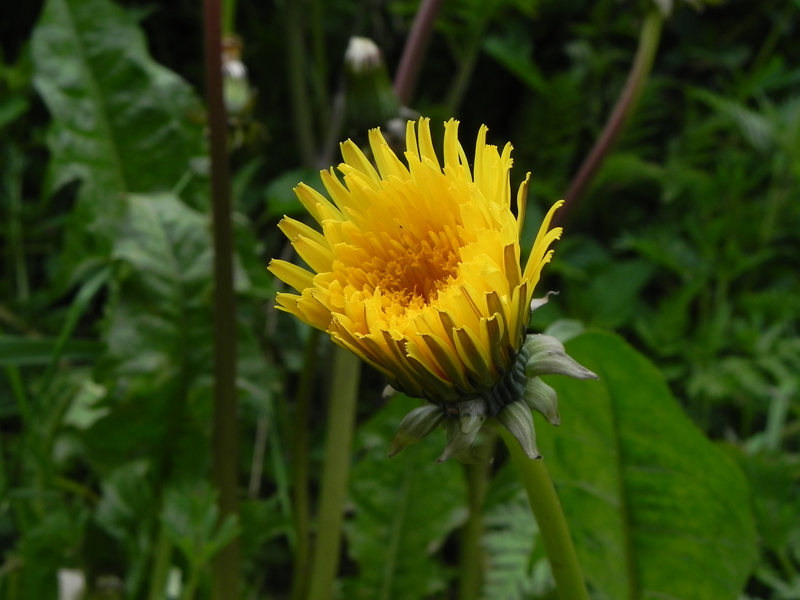 The Dandelions are having similar problems, they have a rosette of leaves at ground level so they keep up with the times by growing longer and longer stalks on their flowers. They are now looking like miniature skyscrapers with large yellow revolving restaurants on top. 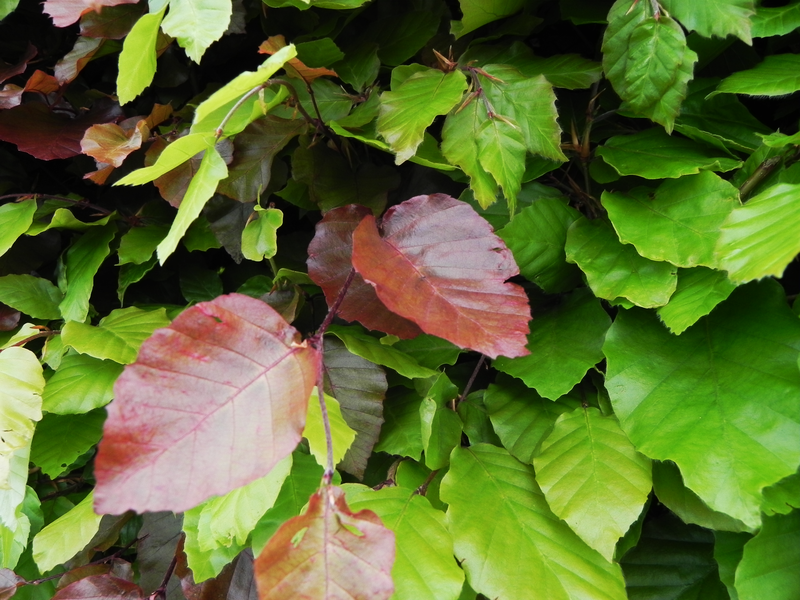 We have a few Beech hedges around but I thought you might like this one as it has a few Copper Beech bushes intermingled with the green. Well, here we are, it’s 29th May – and here we have, May Blossom. Thank goodness for that, we can all take our clothes off at last. The other thing we can do, now the blossom is out, is to cut bits off the tree. Just don’t take the blossom indoors though, that is unlucky. This is only common sense really. The flowers are pollinated by insects who are more at home on road kill and other sorts of carrion and the flower’s perfume is designed to be attractive to them not to, the more finicky, humans. Now that the fairies are happy for us to cut the tree, this is a good time to collect a bundle of twigs and weave them into a ball. If you did this last year, as soon as you have the new hawthorn ball made, you can burn the old one and get rid of all the problems that beset you through last year. Keep the new one in a safe place, so you can get rid of this year’s problems in the same way next year. 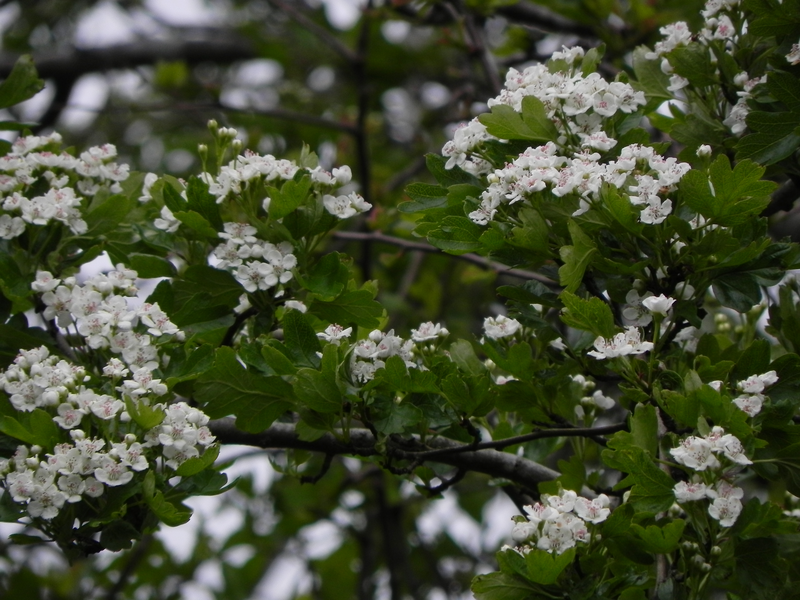 The Hawthorn is called a Hawthorn because the old name for a hedge was a haw and haw thorns were the bushes of choice if you wanted a good solid hedge that the sheep and cattle wouldn’t be able to break through. And they do look pretty in May – if they make it in time. Sheepdogs are a breed apart, they don’t just herd sheep, although that’s what they like to do most of all, it gives them immense satisfaction to gather a scattered flock together and push them gently in the right direction, sheepdogs care for sheep in much the same way that the shepherd cares for them. To the shepherd the sheep represent his income and the continued survival of his way of life, to the sheepdog the sheep represent his or her life’s work. To the sheep, the dog will often be someone they have grown up with and in many ways someone they trust. The Dog and I have stood and watched in awe as a small flock of sheep actually followed a sheepdog from one field, down the lane and into another field while the shepherd stood by his parked truck and whistled his instructions. As soon as the sheep where safely ensconced in the field with the gate closed, dog and shepherd jumped into the truck and drove off. Quad bikes, of course, are the new thing and they do for a farmer what a good horse did for the cowboy in the wild west, they make it possible to compete with the animals on their own terms – something we fragile bipeds can’t hope to do. 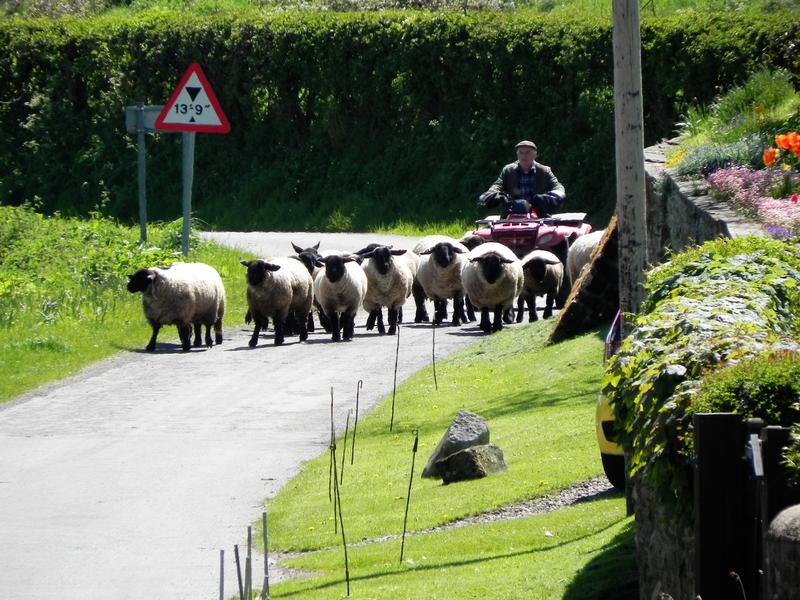 But a quad bike will never care about sheep the way a sheepdog does. We have had two marvellous days weather-wise – yesterday and the day before. Today, just to make sure we don’t expect a summer this year, the weather has fallen back into its old habits, We have grey skies splattered with rain clouds and a very grumpy wind stomping round rattling doors and slamming bin lids, generally making it known that he is not happy and that they better do something about it pretty soon or there will be trouble! The Dog had planned to sit on her favourite chair for most of today and then this evening watch a little television – she enjoys wildlife, farming and gardening programmes – she had hoped that Jackie and I would, perhaps, go out for our morning walk and leave her at home. As it happened both Jackie and I were feeling the same way, but conscience won out over convenience and we all three set off in the end, telling each other that this would be just a short walk. On the way down to the beck, with my collar turned up and my fingers tucked inside my sleeves to keep them warm, or at least out of the direct blasts of icy wind, I noticed that most of the wild flowers on the verges, had taken the sensible option and stayed in bed this morning. The Dandelion had one eye open, but he still had his duvet tucked up round his ears. There are still large numbers of bluebells about – true most have lost the deep blue they had when they first burst into flower, but even as the colour drains away and they become pale shadows of their former selves, glimpsed through the trees, a large spread of flowers carpeting a glade, or perhaps just a patch of sunlight, can catch your breath. Bluebells are one flower that definitely improves with quantity. 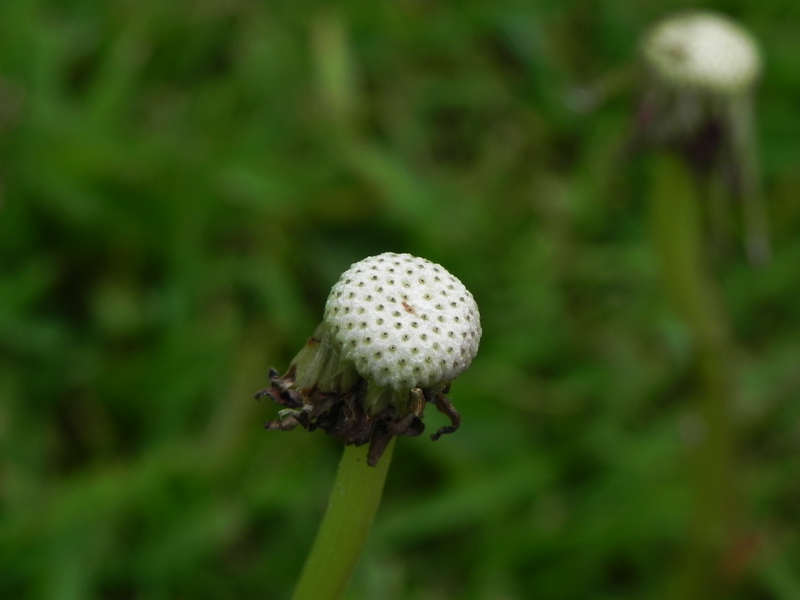 As a single flower the individual blooms are an attractive enough bell shape, I suppose, but I’ve always felt that that great chunky stalk rather spoilt the effect. It’s no wonder that, over the border in Scotland, they chose the far more delicate Harebell for the Bluebell of Scotland. Flowers, in general, do seem to excite the senses more when we perceive then en mass. Think of a carpet of primroses for instance and the more delicate violet is absolutely lost individually but quite eye catching if you come across them dominating a patch of roadside verge, short grass or moss. A clump of bluebells on the roadside, is interesting enough – the first time you see them but, really, you might as well pick a bunch to take home and put in a vase. They are just not ‘full on’ flowers, they don’t have the size or texture to make a coffee table or sideboard their own. Buy a bunch of dahlias or chrysanthemums if you want flowers in a vase, cut flowers have been bred for the job. 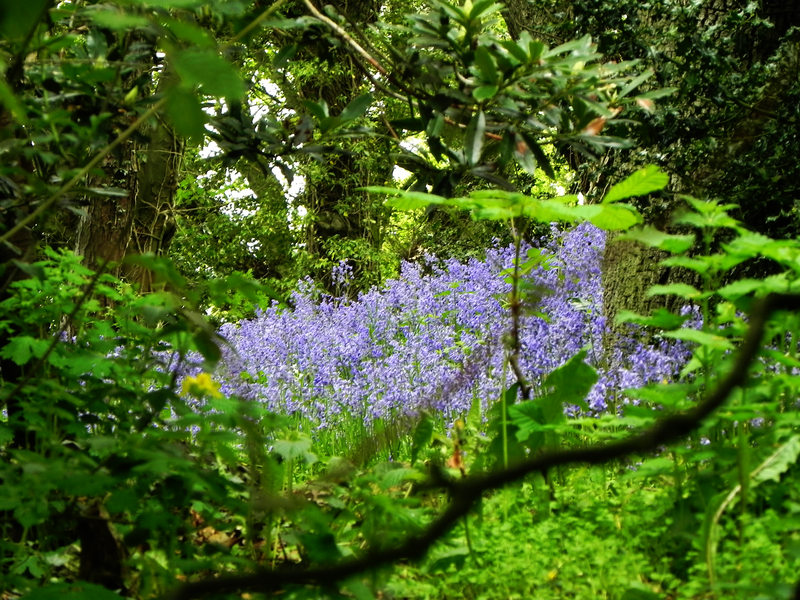 Bluebells come into their own when seen out of the corner of your eye through dappled light filtering through leaves. It’s that stab of beauty, that millisecond surge of emotion so beloved of poets. That’s where bluebells come into their own. 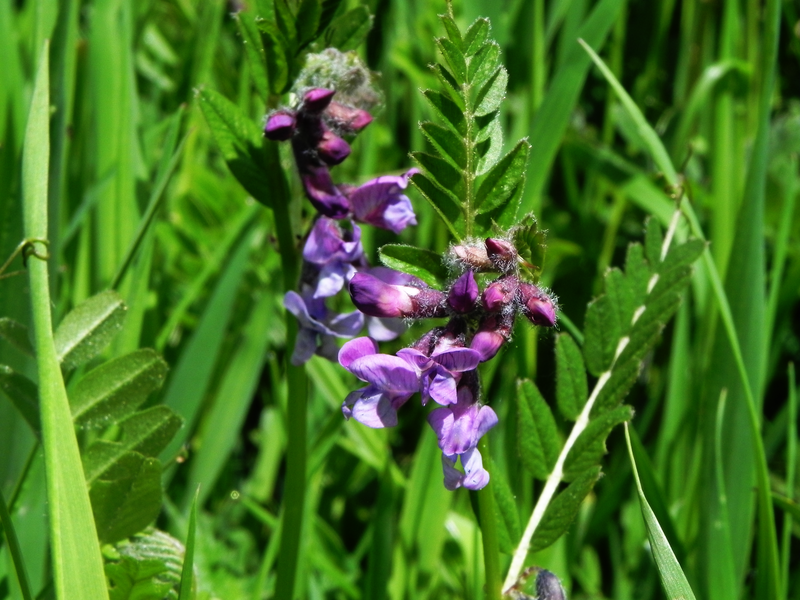 There’s Bush Vetch, it grows everywhere and it has leaves with hairs that stick out the ends of the leaves. Then, there’s Common Vetch, it grows everywhere and has hairs that stick out the ends of the leaves. Sometimes the plant world really irritates me, I think it does it deliberately. They both have green leaves, they both have those funny purple flowers and they both have pods with little peas in them. If they want to be different, that’s fine, but they should have a bar code or something somewhere on the plant so that we could identify them if we needed to. And this is the nub of the matter, do we really need to know that these are different plants, couldn’t we just lump them all together and call them Vetch? Well, here we have a photo of some sort of Vetch, there is a lot of it about, so we are going to assume that it is Common Vetch. There, problem solved. Being from the pea family, it does that thing with nitrogen, so it can be grown just to be ploughed in. It is also often grown as a stock feed and generally animals love it and will eat too much of it, if they are given the chance. They will then complain of stomach aches and pains.